I don’t think I’ll have access to Interent as hotels there don’t offer access for free. This new one is nice, simple and clean. It’s called NewZen v2.0, get it here if you like it. The live search doesn’t seem to work all the time. I have included Google Technorati and Swicki searches in the same group. Successfully got rid of the border around image links, this is a must before I put this theme to use. Borrowed codes from Kubrick Theme to show where you are at the top of sidebar when you clicked search, category or archive links. Removed measuremap link from the footer, I don’t have an account it must have been put in by the theme author. Changed the sidebar color to suit my taste. I used Paint.NET to do that but file ended up 10 times large than original. I’ll have to find a way to get it smaller or use something like icon maker. Added a divider to end of each post, again that image is borrowed from Connections Reloaded. 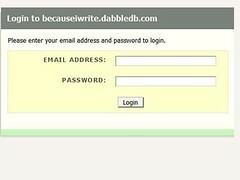 Just got trial account free for one month with this innovative dabbledb. It’s fairly easy to learn how to create and add new data to your database. Import of data from, say a column in excel, is easy. I hope in the future it should allow uploading of a spreadsheet for import to the database. Surprising it is supposed to be a web2.0 product, i.e. I expected lots of AJAX’ish gimmick. You’ll be disappointed as many clicks I have done required refreshing but their server is very responsive therefore you won’t complaint. Generally it’s easy to get started but to make something really useful you’ll need at least half an hour. I would suggest they add tutorial or template for users. Generally I think this is up to par or even slightly better than ZohoCreator. Your account looks professional as it appears as subdomain to their site, such as mine here. I surely have not spent enough time for a thorough test drive, for more indepth review see TechCrunch’s post here and here, don’t miss the comments that lots of other “pros” have made there.